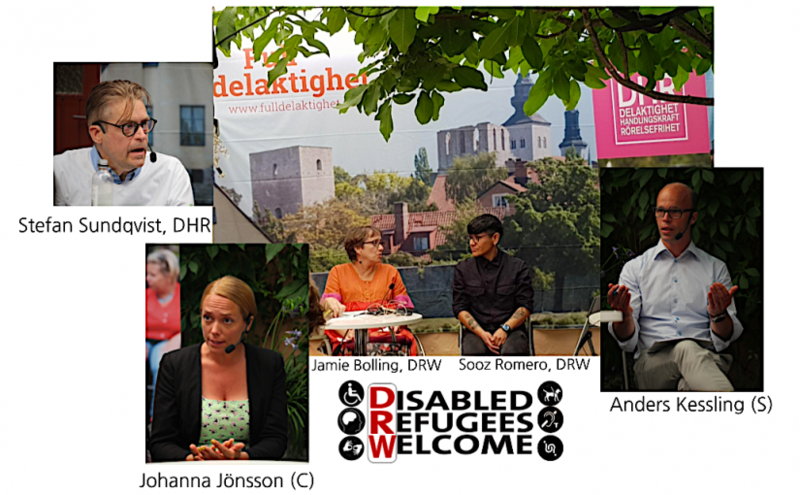 Better interviews from the start, and better cooperation between authorities; these were often the proposed solutions to the problems discussed at Disabled Refugees Welcomes’s seminar at the Almedalen Week. Non-normative abilities and needs for support should be identified at an early stage with this method. Anders Kessling, State Secretary to the Minister for Employment and Integration Ylva Johansson (S), called for better cooperation between different authorities, for example, between the Swedish Public Employment Service and Health and Medical Services. The individuals are often forced to negotiate the system by themselves which often is hugely burdensome. We need to become better at supporting individuals with this. Johanna Jönsson, Member of Parliament and spokesperson on migration issues (C) have high hopes on the Inquiry on the reception and housing of applicants for asylum and newly arrived migrants, which, according to her, has remedies for a ”whole series of issues”. The inquiry proposes, among other things, that the newcomers should stay at the same place during the first weeks, where representatives for different authorities also will be present. This would mean a more organised reception where all the different agencies are on location and help each other take stock and formulate an action plan, so each individual gets the support that person needs. Sooz Romero, method developer at DRW, raised the issue of societal attitudes, that newcomers are ”talked about as if they do not want to work but have come here to live on benefits”. Sooz means that we politically have embraced this discourse and that the New Moderates’ proposal, where newcomers would need to qualify before receiving social insurance benefits (as reported by Assistanskoll), is part of this. Unemployment in this group is sky high because the individuals do not get the support they need and workplaces are inaccessible. How can you expect them to live up to criteria that are not adapted to them?, asked Sooz. Johanna Jönsson responded that The Centre Party also have similar proposals and that some of these proposals already have been implemented, in cooperation with the government. Newcomers cannot have ”larger advantages than if you are a resident in Sweden”, she said. However, it is essential to acknowledge the pre-conditions individuals have. Of course, support must exist if you suffer poor mental health or have other non-normative abilities (a.k.a. impairments) and are excluded from the labour market. Anders Kessling said that ”work is the linchpin”. The objective is to get everybody working; this is what we dedicate most time to. The moderator, Stefan Sundqvist, DHR gave a reminder that the obstacles for disabled people generally are much higher, which is visible, for example, in the unemployment statistics where unemployment for disabled people on average is 80 per cent irrespective of the market situation. Anders Kessling responded that this is why it is crucial with a special policy for the issue. This is precisely why it is essential to detect pre-conditions by stocktaking and that this is done efficiently because otherwise, you lose the whole toolbox. Both Anders Kessling and Johanna Jönsson strongly object to the idea of ”we and them” and the view that newcomers do not want to work. Johanna Jönsson also said that she hears ”such noise” now and again. However, when I meet newcomers, I encounter frustration that you are not allowed to get started, that the systems do not work and that you do not get the jobs you apply for. Bolling, project manager, DRW recounted that a young woman with extensive non-normative abilities had to relocate seven times during a year. Sverker Ågren, an audience member with experience of working at the Swedish Migration Agency, said that the problems had severely increased during the latter years, and he did not subscribe to the argument that this was only due to the large numbers of newcomers during these years. The pace of relocations has increased dramatically during the latest year due to many accommodation units closing down. And this is controlled by the government and their directives. Every task directed at helping these people demands continuity and close contact – this gets destroyed when you are moved around like it is done today. These people suffer tremendously. Anders Kessling said that this is of course not acceptable, but the Swedish Migration Agency is in charge of this issue. According to the Swedish Migration Agency, the main driving force is all the public procurements and that you have to follow a specific decommissioning process. Also, the Migration Agency are re-organising their accommodations, so it has nothing to do with any governmental directives. Johanna Jönsson said that the relocations are a problem for the entire society and pointed, among other things, to schools that have not been able to plan their activities and authorities unable to work long-term. She brings up the Inquiry on the reception and housing of applicants for asylum and newly arrived immigrants again. There is a proposal that you will get an assigned municipal placement much earlier so that you do not have to stress about whether to stay or not, if you yourself do not want to move. One issue where the Social Democrats and the Centre Party differ from each other concerns restrictions on family reunification. The issue is really applicable for all newcomers but, as Sooz Romero said, “as usual it hits much harder against disabled people”. Johanna Jönsson noted that the Centre Party is totally against these restrictions, and are highly critical of the government. The major problem is that the government now prevent families from reuniting and we have people here who live without their children and closest family members. And the people left behind in the country of origin have an extremely vulnerable situation and are just waiting to come here. We have to be honest and say that this works against an establishment. It was done to bring down the number of asylum seekers, so we have to own up to that. These were difficult and unpopular decisions. We believe that permanent residence permits with a right to family reunification are absolutely the best. We have had this for a long time, but we it was not possible this time. In the agreement that then has to be made, we must live up to all the obligations we have but also to the fundamentally humane in letting families live together, Johanna Jönsson said. Anders Kessling said that the Social Democrats was open for discussions after the election. We have to attempt to form those broad majorities that are possible both to maintain order within migration policies and a good establishment. Previous Previous post: Disabled Refugees Welcome at the Almedalen Week!